I love skirts so much! 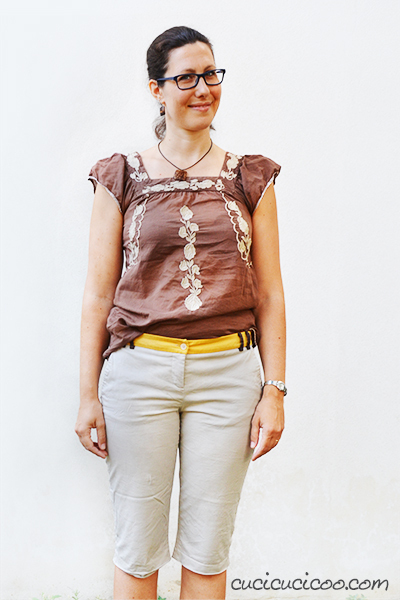 They are fun to mix and match with different tops, I feel free to move around without any leg restriction, and even very casual skirts look nicer than jeans. 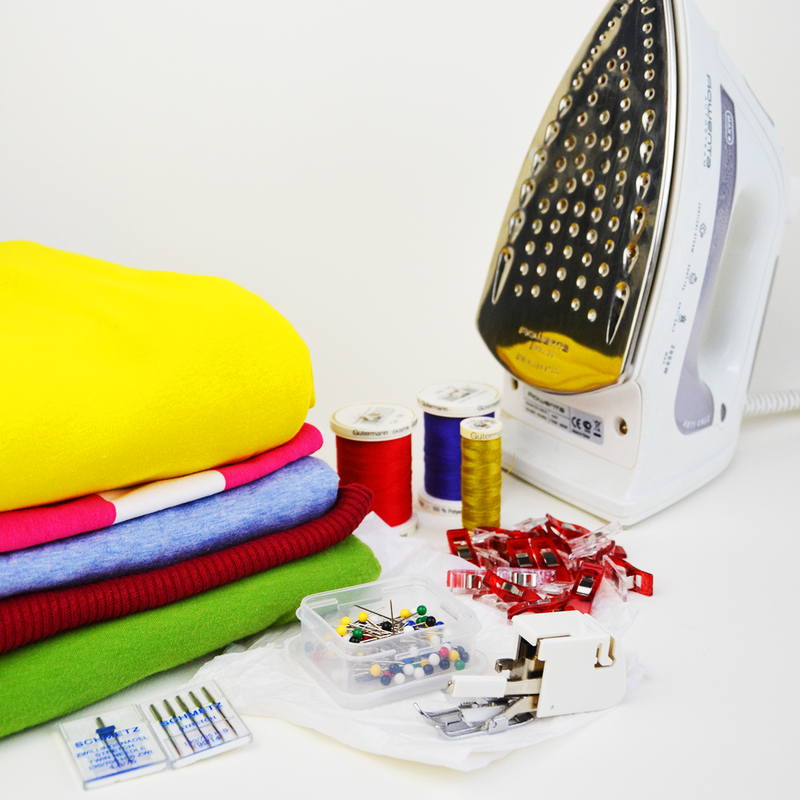 They are SO FAST to sew and often even faster to refashion from other unused garments! …this unfortunate pair of shorts? Ick! I’d bought them because I really liked the contrast color waistband and belt loops. (Oh, and also because they were on a great clearance sale!) I hadn’t quite considered the fact that I don’t wear my tops tucked in, so those details could never be seen. And I soon realized that I didn’t like the way they felt or looked either. Then one hem started coming undone, and they stayed in my drawer for years. Inspired by some of the amazing jean skirt refashioning ideas I’d saved onto my Refashioning Pinterest board, I decided to open up the legs and add contasting godet panels. 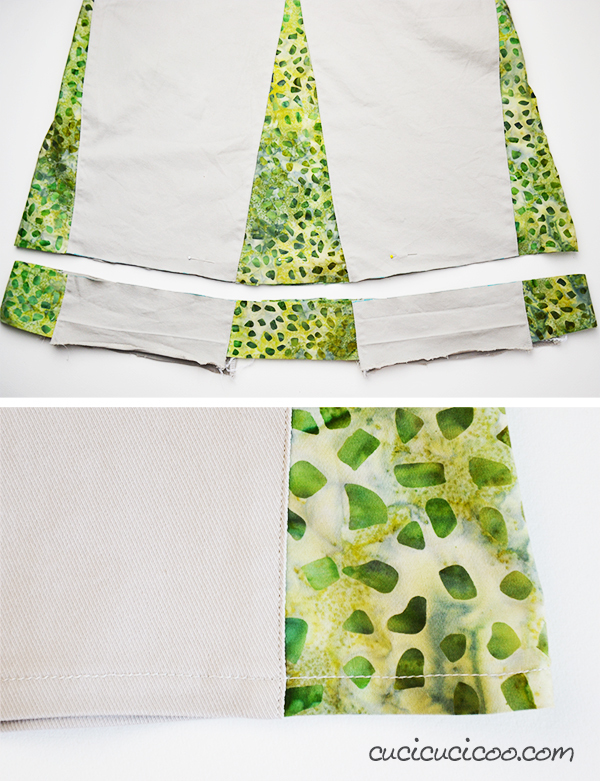 Because the legs were on the tight side, and also because I really love this green batik fabric, I decided to add godets not only in the front and back, but also at the sides, that way I could easily create an A-line shape and make the contrasting panels look more intentional. And I LOVE how it came out! It’s such a comfortable skirt and I love how it looks. I actually made this about a year ago and I’ve worn it a TON since then. 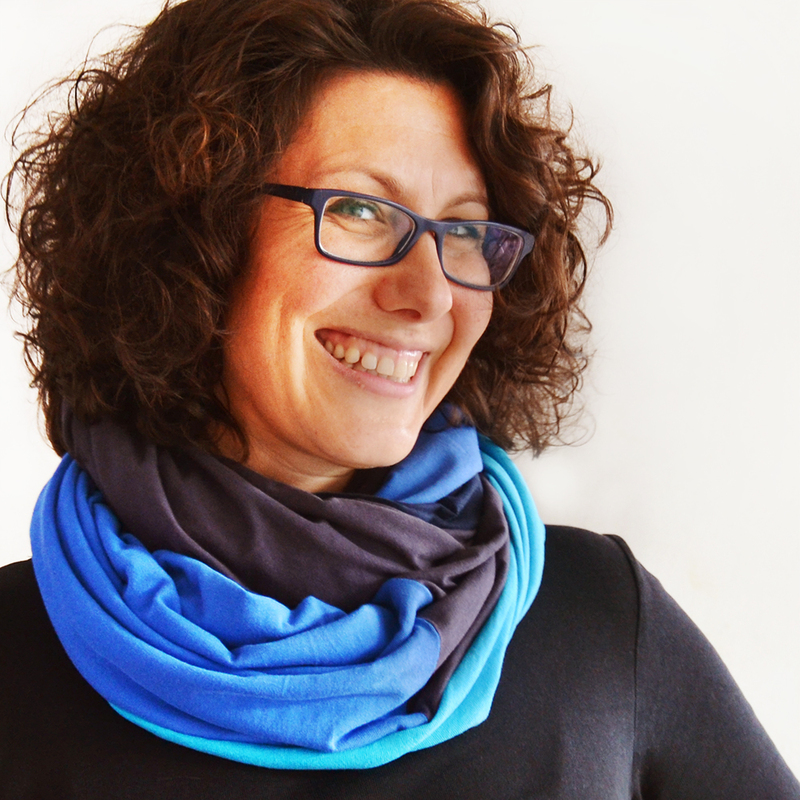 One of the great things about making your own clothing (or refashioning them) is that you can make perfectly matching accessories! 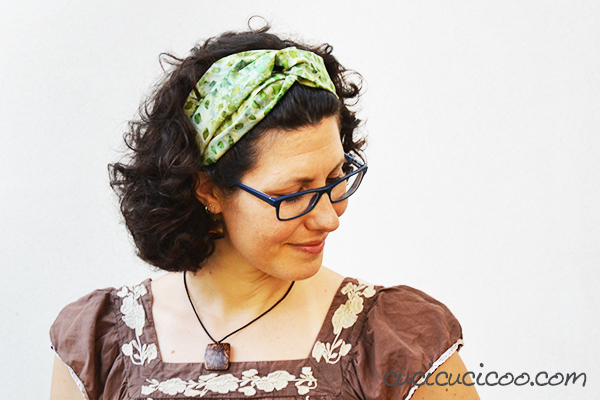 So I sewed a twisted turban headband with the same batik fabric to wear along with my skirt! 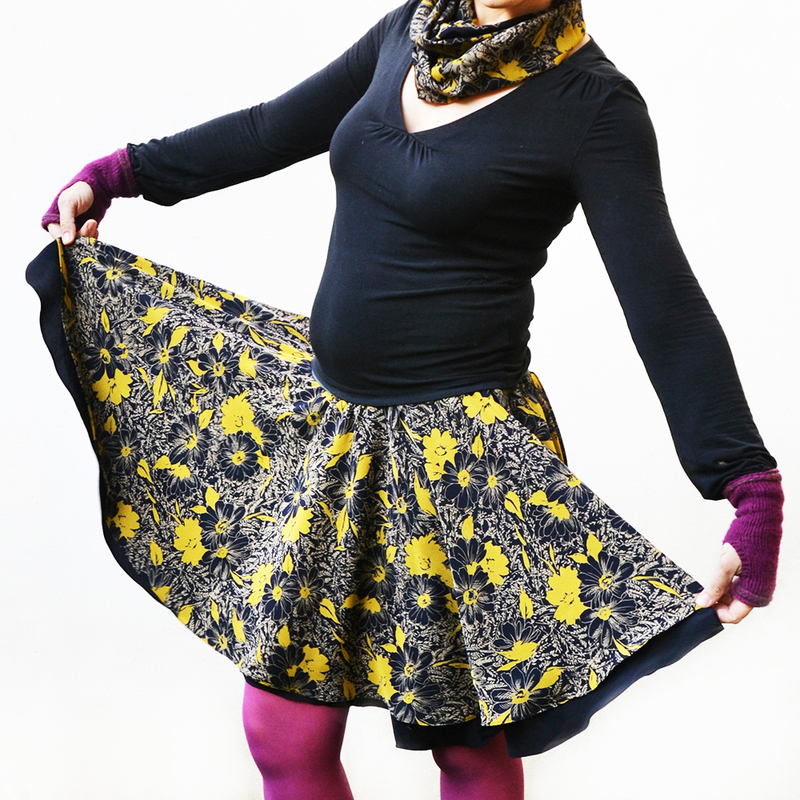 I love it when people ask me how I got an accessory to match my skirt so well, and I can tell them that it’s because I made them myself! So, what do you say? Do you have some old shorts or pants that you never wear from one reason or another? 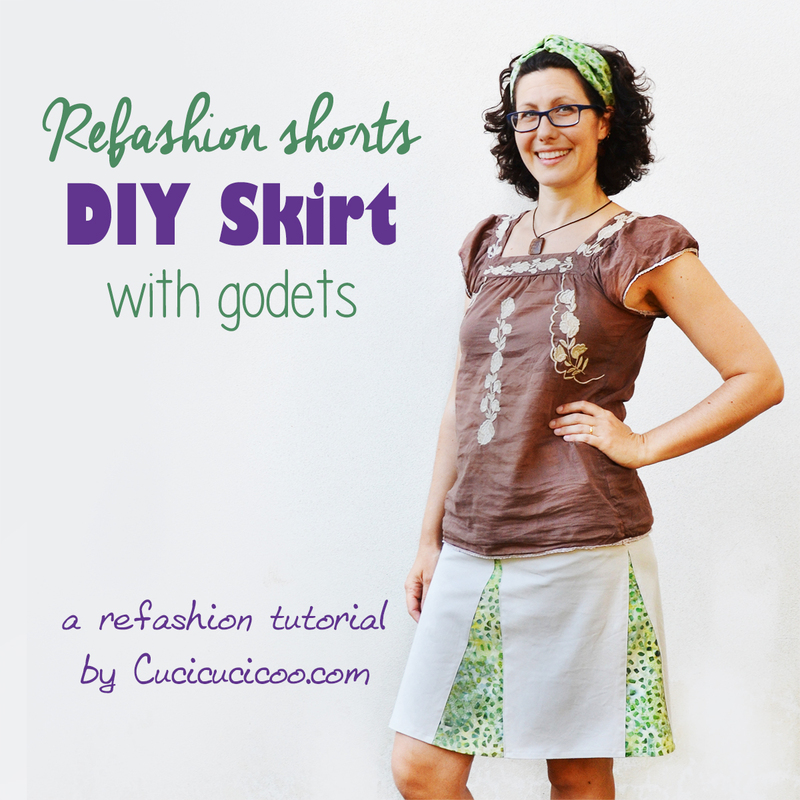 Let me show you how to transform them into a DIY skirt with godets that you will want to wear all the time! Let’s get started! 1. Remove the hems. 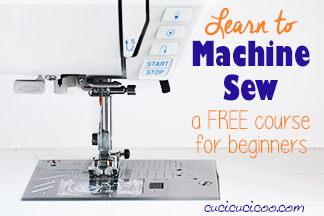 If you have plenty of extra fabric to sew a hem later, you can just cut them off. I used my seam ripper to open up the hems and then I ironed them flat as well as I could. 2. Open up the leg seams with your seam ripper up to the crotch. I chose to open up all four leg seams for the reasons I said before, but you can choose to just open up the inside leg seams if you prefer. 3. 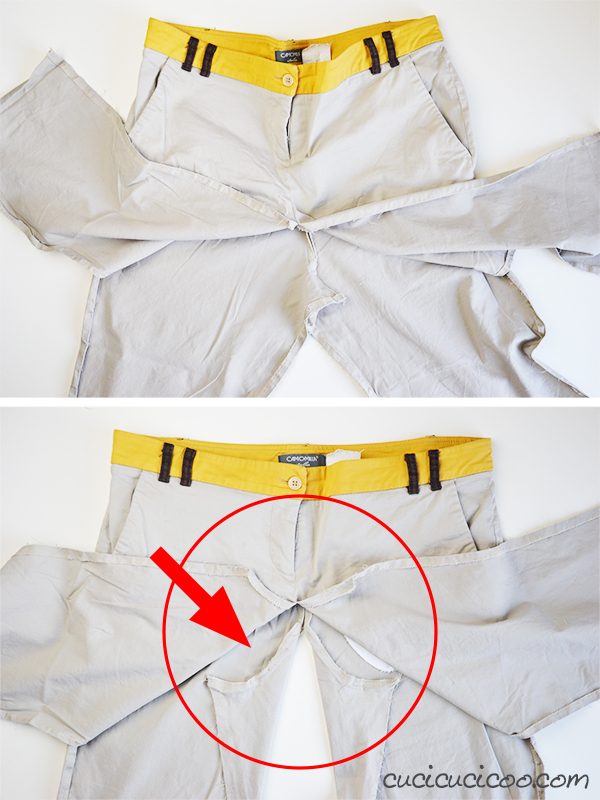 Continue opening up the front and back crotch seams until you reach where the shape is no longer contoured (shown in the circle above). 4. 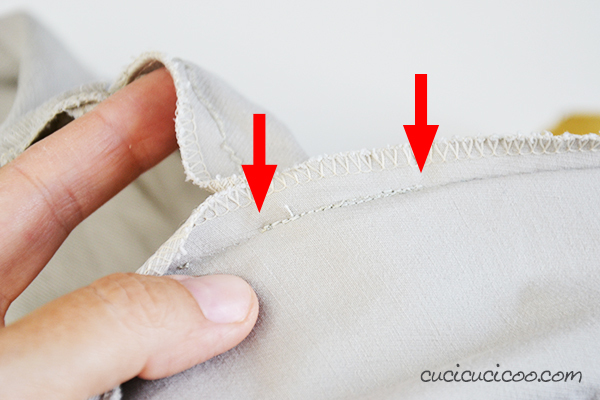 If you chose to add panels on the sides, sew some stitching along the original seams (shown above between the two arrows) to make sure that they don’t open up any further. DON’T do this for the crotch seams. We’ll get to those next! It’s not so important how far up you open the side seams. I wanted the side panels to match the size of the front and back panels, but I had to stop a little lower to avoid opening up the pocket. 5. 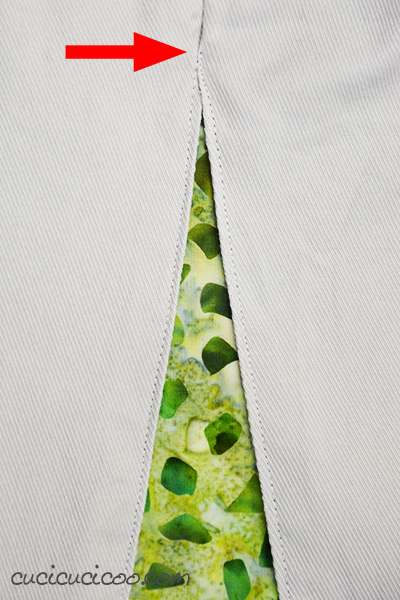 Flatten the shorts inside out so that the two curved edges of the back crotch are matched up. 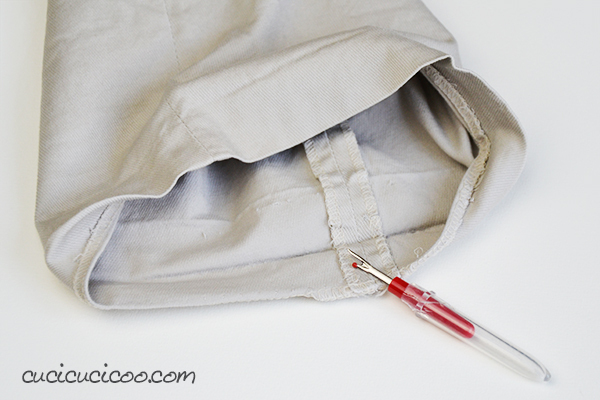 Draw a line with a ruler and a fabric marker and cut off the contoured part all the way down. Repeat with the front crotch. Then repeat step 4 to keep the crotch seams from opening up any more. You now have shorts (or pants) with more or less regular rectangle shaped parts hanging down. 6. 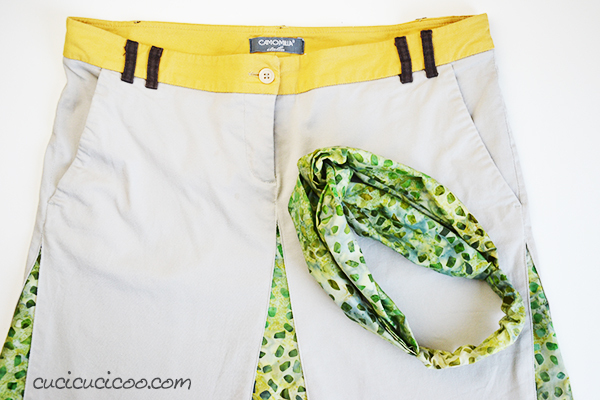 Lay the shorts out flat so that the rectangular parts are opened up naturally. Measure how wide the space is between the bottom of each rectangle (shown above) and also how long the space is from the center of the bottom to the top point where the rectangles join. My space was 15 cm wide and 45 cm high for the front and back panels. The side panels were slightly less high. 7. Cut out the triangular godet inserts according to your measurements. 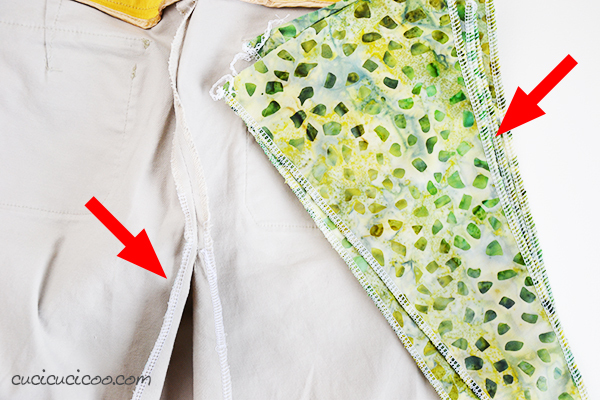 If the fabric is considerably more lightweight than the shorts fabric, you might want to use double layers of the fabric or add an iron-on fabric stabilizer to the back. 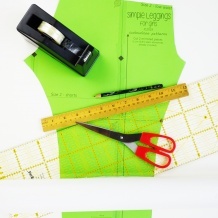 Remember to add margins for the fabric to overlap, so add at least 2 cm to each measurement. So my triangles, instead of being 15 cm across at the bottom and 45 cm high through the center, as were my measurements, I cut them 18 cm across the bottom and 48 cm high. And also remember that these inserts are isosceles triangles, so the two long edges are of the same length and the longest point goes through the center. The easiest way to cut them out perfectly is to fold your fabric in half along the grain (parallel to the selvage), measure half of bottom width perpendicular to the fold (in my case, half of 18 cm is 9 cm), and the total height along the fold from where you measured the bottom. Cut along the bottom and from there diagonally up to the top, unfold the fabric, and you have a perfect isosceles triangle! If your inserts are different sizes, make sure you mark them somehow so that you don’t mix them up! 8. 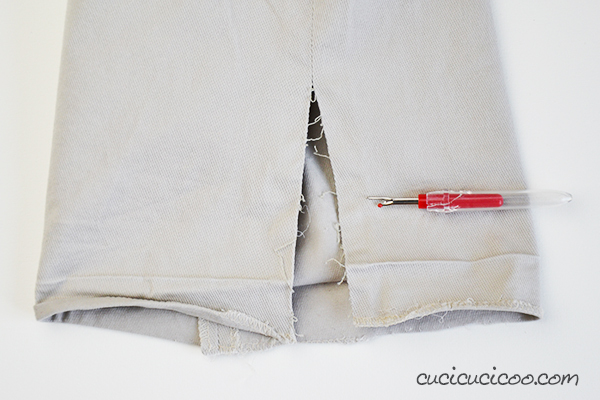 If you are using a fraying fabric for the shorts and/or inserts, overlock or zig zag along the long edges. Don’t worry about the bottom edges because we will be hemming those later. 9. 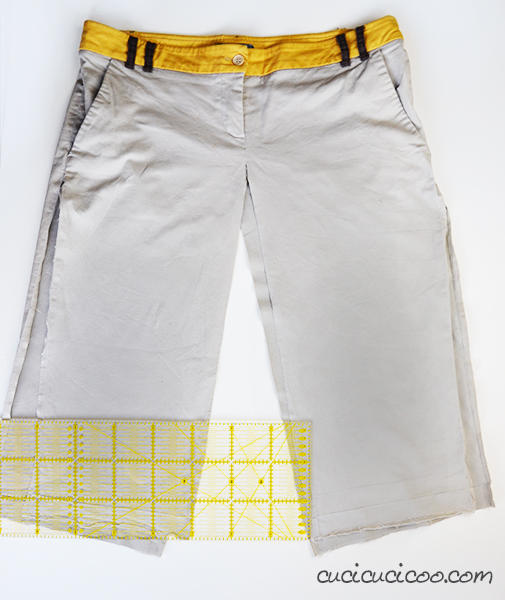 With the shorts inside out, fold the cut edges towards the wrong side by about 1 cm and iron them flat (picture to the left above). 10. Line up the top point of the matching insert with the top corner of the shorts’ opening, with the wrong side of the insert facing up, so that they overlap by about 1 cm. 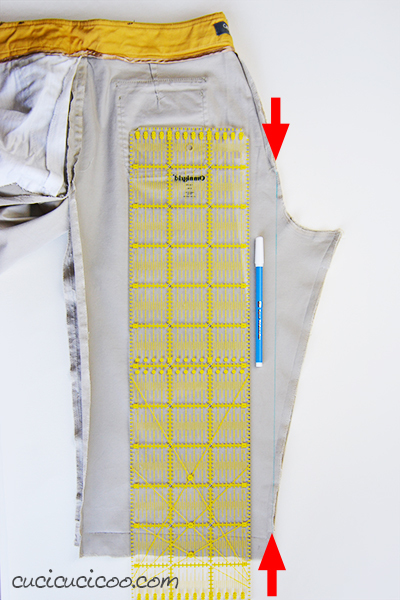 Pin it in place, then line up one edge of the insert with the edge of the shorts, pinning them together as you go (picture to the right above). 11. Then line up the other side of the insert with the other side of the shorts opening. Notice in the picture above how the edges of the insert match up with the edges of the shorts, while overlapping. 11. Carefully flip the shorts right side out. 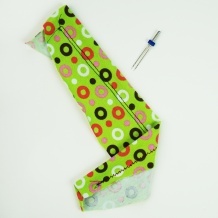 Make sure that the overlock or zig zag stitches on the edges of the insert are not showing from the front. 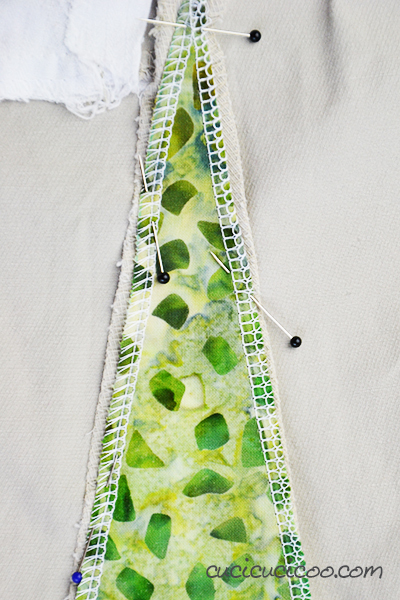 Then pin the insert in place from the front, removing the pins from the back as you go. It’s very important to check the top point (shown by an arrow) and pin it very well in place. 12. 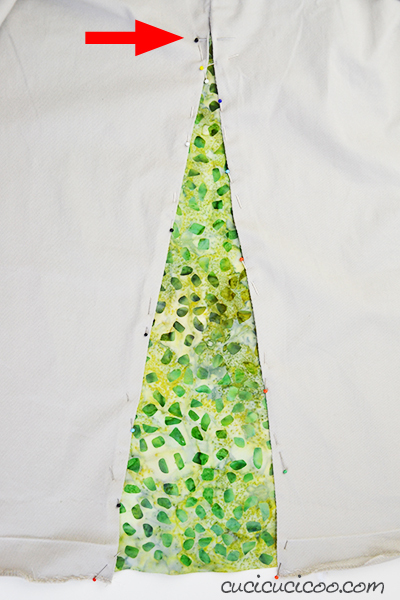 Sew down both sides of the godet from the right side of the fabric. 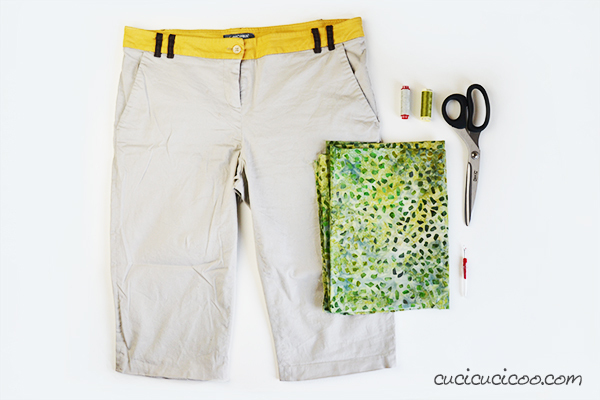 Make sure you sew very close to the edge of the shorts fabric and that you catch the fabric layers in the point without them bunching up. Repeat steps 9-12 with all of the openings. 14. 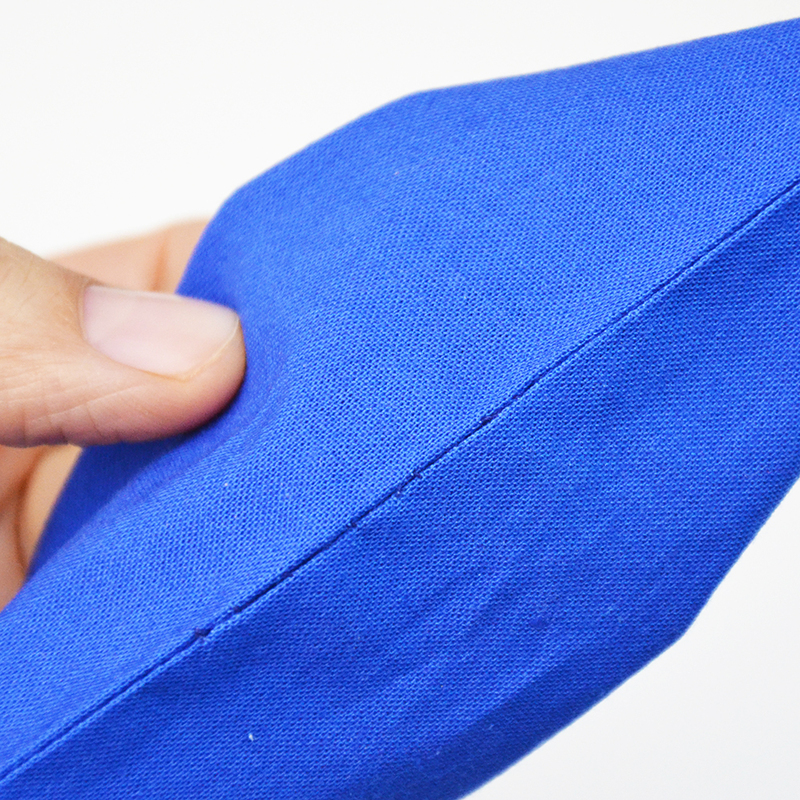 Fold the skirt bottom up by 1 cm, press well, and fold up again by 1 cm and press. Sew the hem in place. 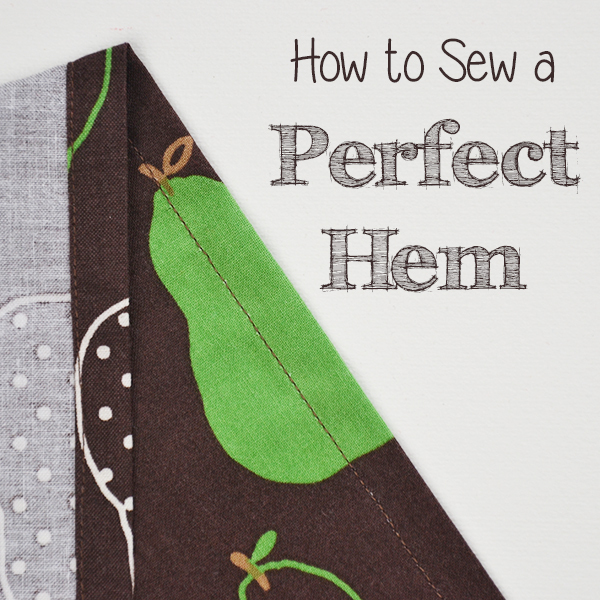 (bottom) If you need help with this part, read my lesson on sewing the perfect hem. 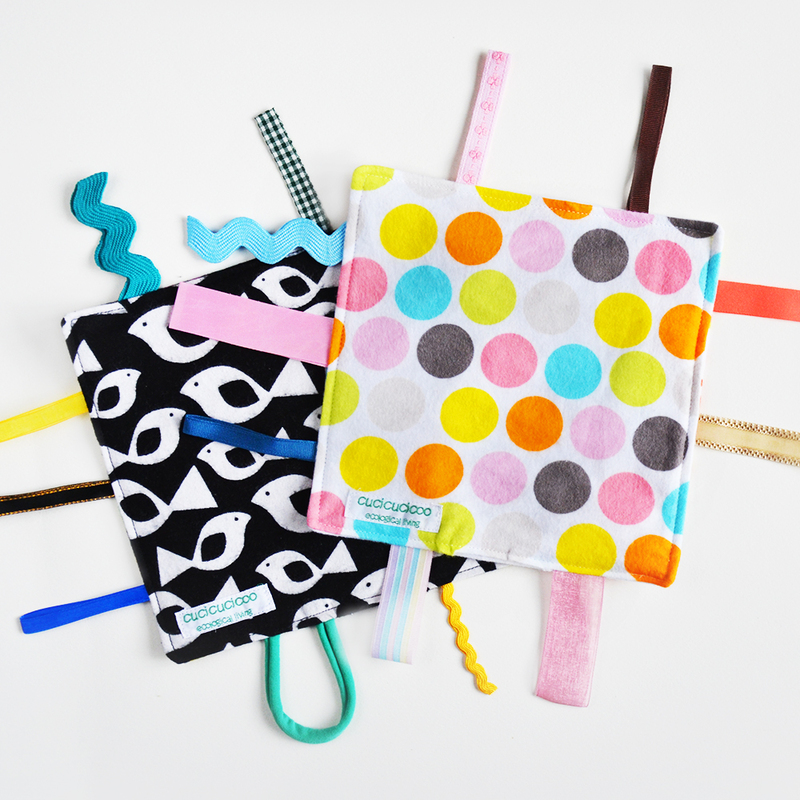 Give it a good pressing and…ta-da! 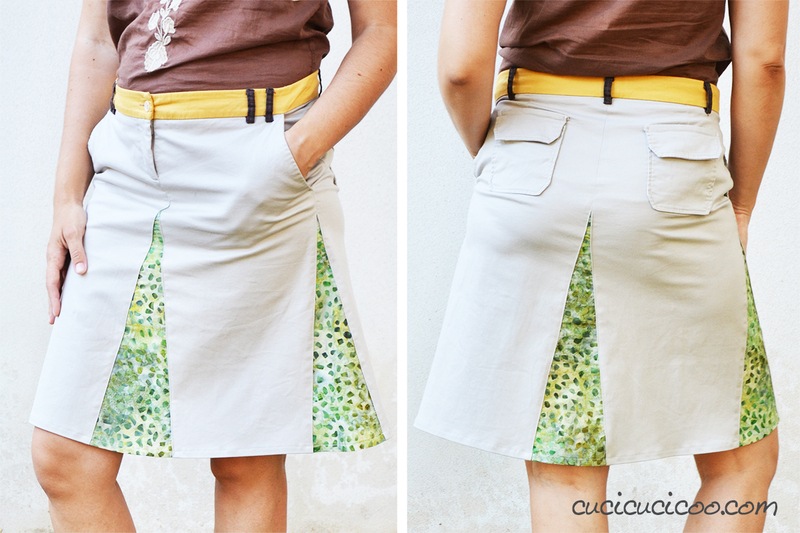 Your DIY skirt with godets is done! Try it on and feel how comfortable it feels! Because I love this fabric so much, I decided to make myself one of those turban style twisted fabric headbands that were so popular last summer. 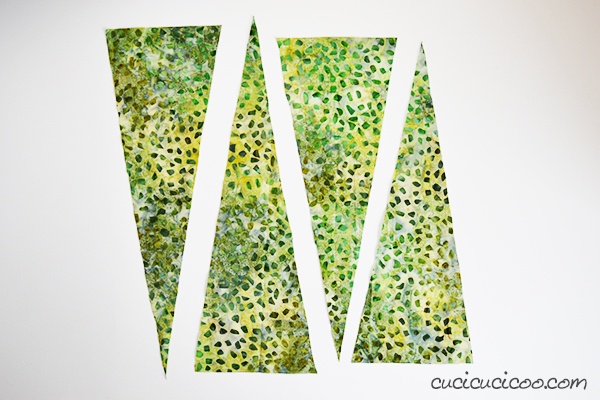 I used this tutorial by Lula Louise (Pin it here) and I was quite happy with the result! A perfect way to add an extra decorative touch to my “new” outfit! 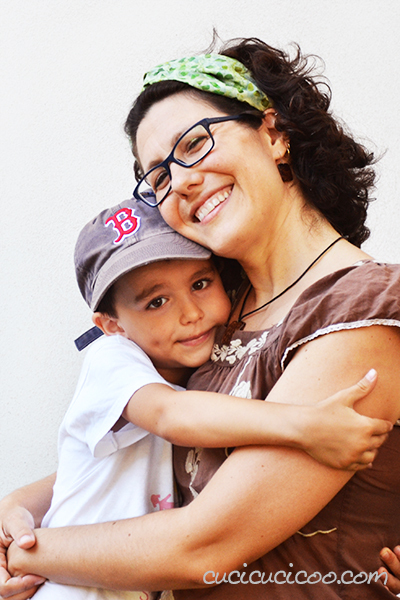 My kids, including my photobombing son, thought that it was “SO cool” that my headband matched my skirt! All in all, I’d say that this transformation was a huge success! I took a garment that I hadn’t worn in years, and turned it into another garment which I wear frequently and look much better in, without spending a cent! Hooray! 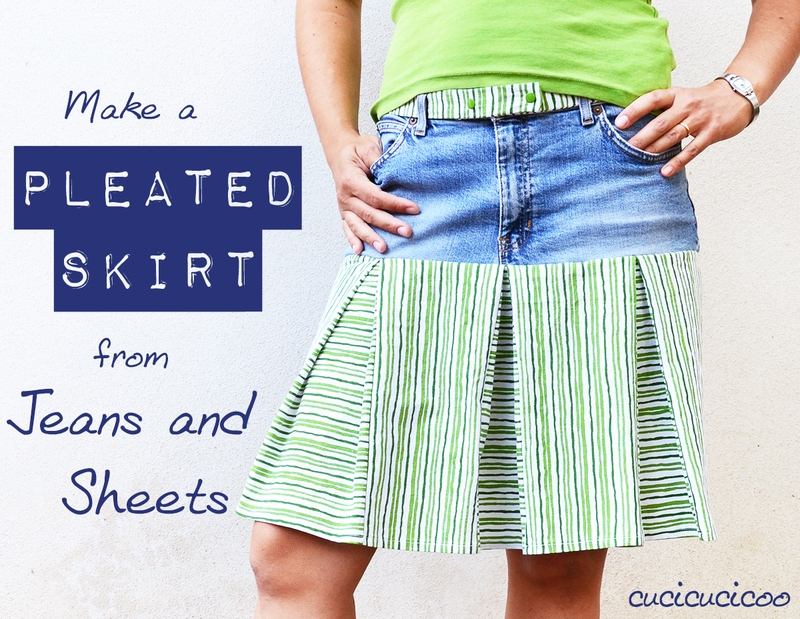 If you love making refashioned skirts as much as I do, be sure to try out this super comfortable pleated skirt made from old jeans and an unused bedsheet! 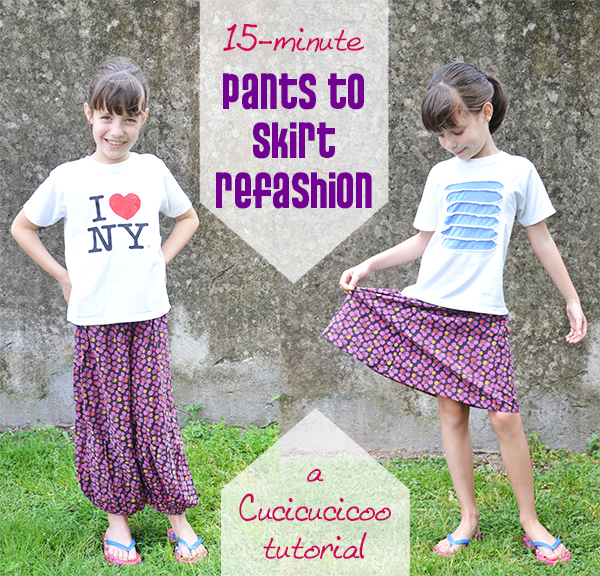 Also check out this other very simple method of turning pants into skirts! I love using this technique for my daughter! 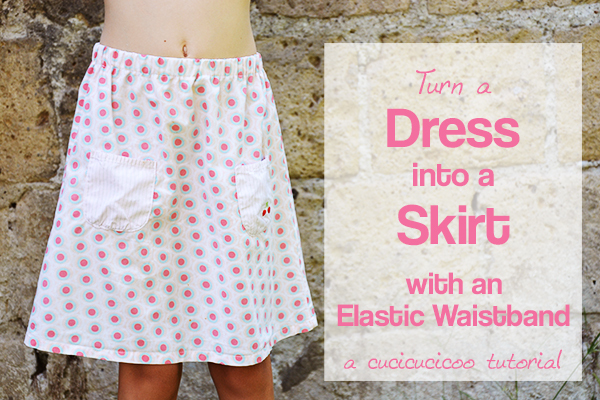 Or this really quick and easy dress to skirt with an elastic waistband refashion! This projects gives great results in just a few minutes! And don’t forget to Pin this project here! Next articleFoolproof Basil Pesto Recipe and 15 Ways to Use it! Cerco sempre di spiegare le cose in modo che non ci possa essere confusione, quindi spero che sia così! Grazie! 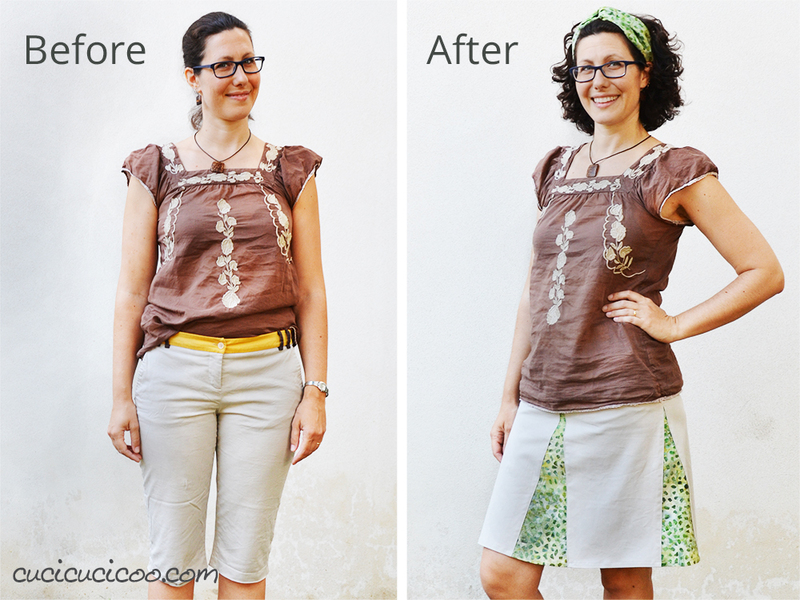 A parte che la gonna ti sta veramente benissimo, adoro anche io questo refashion. 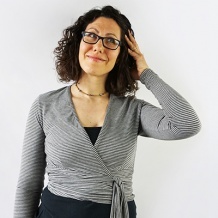 Il verde che hai usato si abbina alla perfezione, per non parlare della fascia per capelli in tinta! 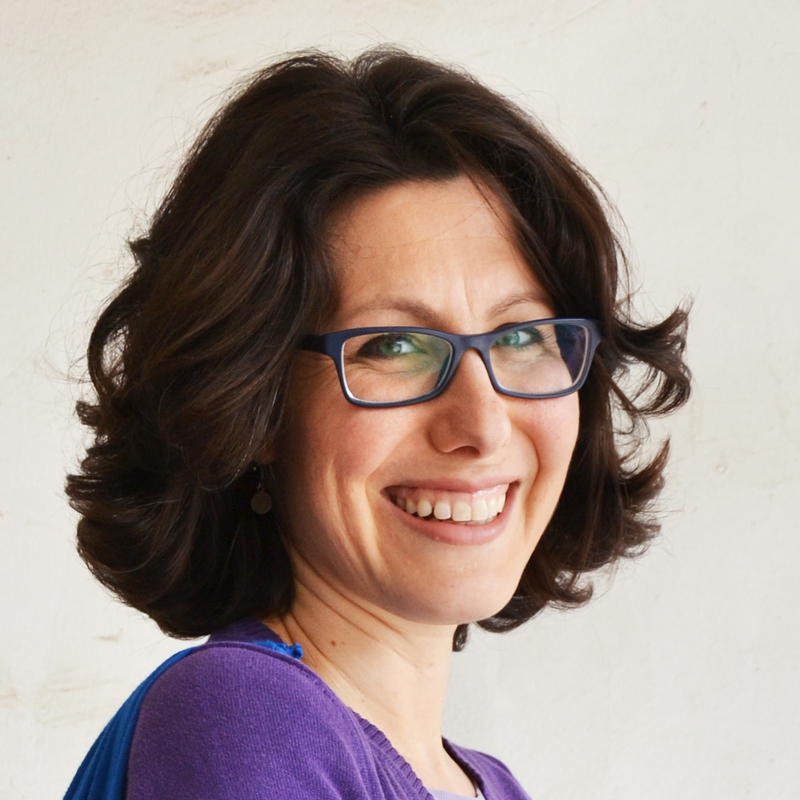 Finora mi sono sempre divertita a trasformare i jeans in qualsiasi cosa, comprese le gonne… Da oggi guarderò con occhio diverso anche i miei vecchi pantaloni! So glad that you like it, Kate! It’s definitely easier to do than to explain. I’d love to see what you come up with! 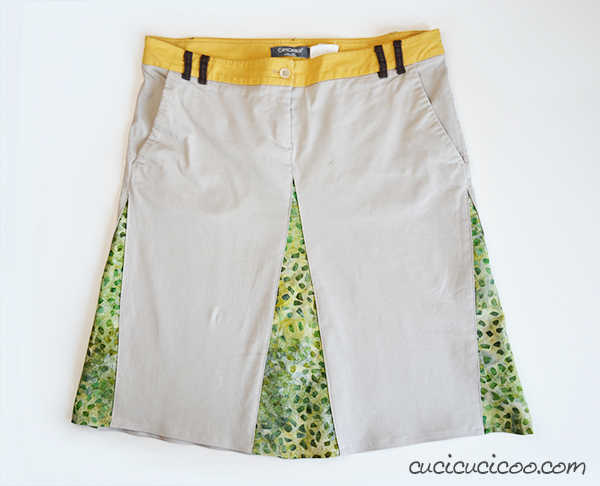 Oh my, how many shorts do I have for this refashion? Many. 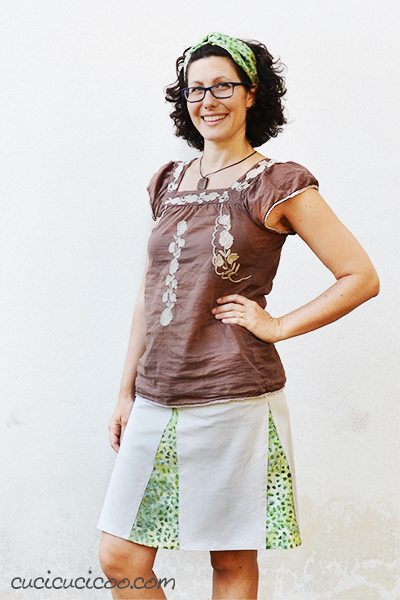 Skirts are much cooler than shorts but harder to find in durable fabric and with pockets. Thank you. I signed up to see what other marvels you share. 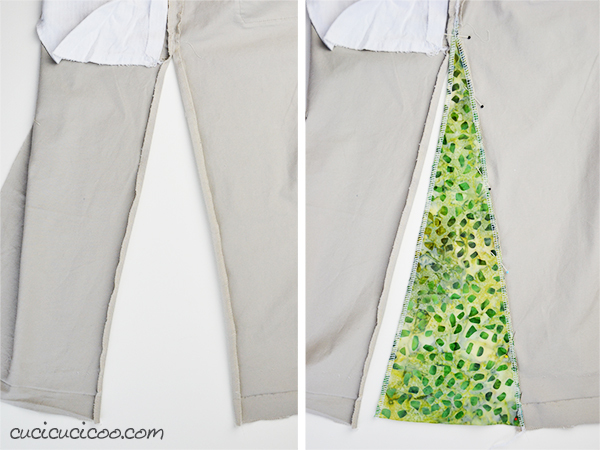 A great way to prolong the life of a pair of shorts no longer worn. Love the matching headband, too. I’ve showcased your fab tutorial today, Lisa.